Checking ID against registration in Bibb County on primary day, May 22, 2018. “And I was like, 'Oh that's tough!’” McClure said. “I think we'll need like a scanner or a copier or something at the football game if we want to register people." 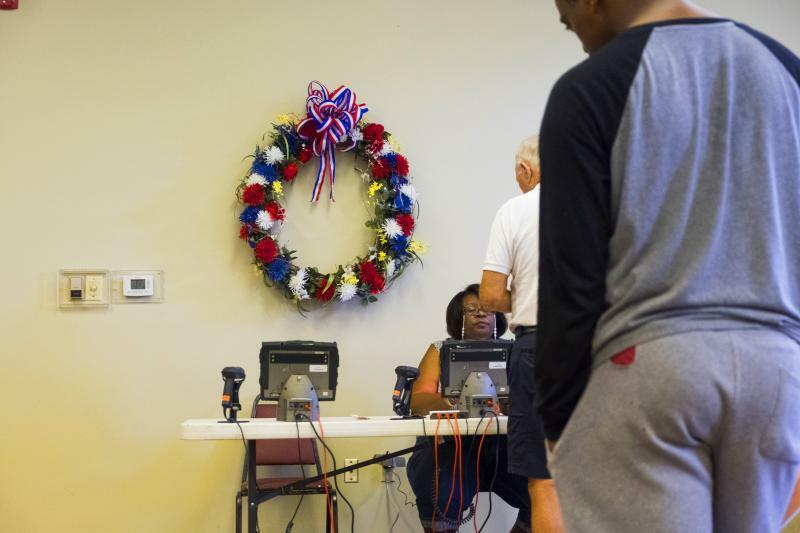 What the registration form doesn’t reflect is that for over a decade, a Georgia voter has been able to wait until Election Day to produce a photo ID to prove they are who they say they are. Now, ACLU Georgia wants Baldwin County to print registration forms in line with the law. But Randy Morrow, the chief deputy registrar of Baldwin County, said that's the job of the Georgia secretary of state. That's true. The secretary of state's office issued a timeline for printing and mailing new forms, but it seems unlikely that those forms would be disbursed before the deadline for registration on Oct. 9. Morrow said his understanding was that he wouldn't get new forms until he worked through all the old ones. In the meantime, the secretary of state's office said old forms are stacked high in every election office in the state. The online form was only updated by this August. “I don't think you should have to be a guru with a finetooth comb to figure out how to register people to vote,” she said. “It shouldn't be that complicated." CORRECTION: An earlier version of this story did not reflect the secretary of state's announced timeline for publishing new registration forms.